With over 18 years experience, Orlagh’s background spans graphic design, design thinking and graphic recording. 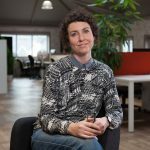 Based at The Ludgate, a digital hub in West Cork, she is part of a network of researchers, editors, artists and developers who collaborate to realise works that fuse business, technology and creativity. Would you like a fresh ear to hear how your business can resonate with your customers? Orlagh will listen to provide feedback and creative ideas to get going with design in actionable, practical ways.